The following is a reference/historical listing of the 70-millimeter engagements of “Absolute Beginners” in North America. 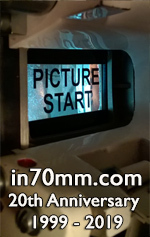 This 70mm release consisted of full-frame prints blown up from Super-35 photography. The audio was Six-Track Dolby Stereo (“A” encoded). “Absolute Beginners” was among sixteen 1986 first-run films released with 70mm prints for selected engagements. The Virgin/Goldcrest production and Orion release — directed by Julien Temple and starring Patsy Kensit, Eddie O’Connell and David Bowie — opened on April 18th, 1986. This information has been referenced from film industry trade publications and regional newspaper promotion. International and second-run/revival engagements have not been accounted for in this article.